Anita Graef really wanted a cello for her birthday when she turned two years old. She remembers being frustrated when her parents made her wait until she was four. Now the 24-year-old graduate student plays cello with the Cincinnati Symphony Orchestra. Graef is in her second year of the CSO/CCM Diversity Fellowship, which connects students with paid professional performance experiences with the CSO while they receive full tuition scholarships to pursue graduate degrees at the University of Cincinnati's College-Conservatory of Music (CCM). The program is currently accepting applications for Fall 2019. 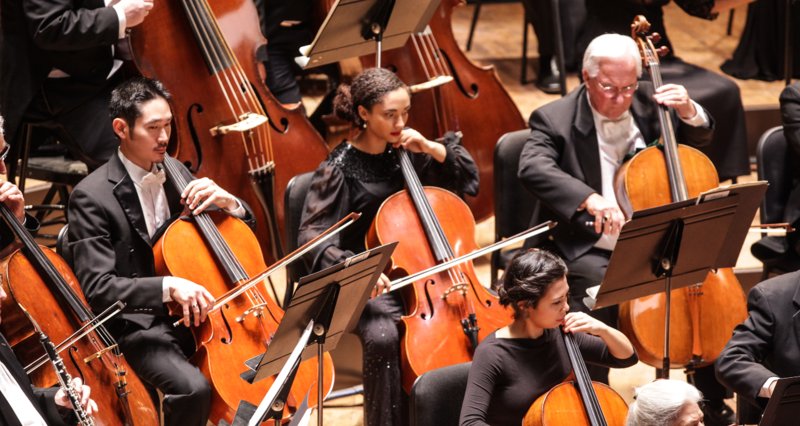 Funded by The Andrew W. Mellon Foundation, the CSO/CCM Diversity Fellowship aims to change the face of American orchestras by making them more inclusive. It provides new opportunities for exceptional violin, viola, cello and double bass players from populations that are historically underrepresented in classical music. The program, which embodies the inclusive excellence of UC's strategic direction Next Lives Here, utilizes a broad definition of diversity that encompasses race and culture while also including first-generation college students and individuals who took non-traditional pathways to higher education. The program’s tagline — “Bravos Without Barriers” — gets to the heart of its mission: eliminating obstacles that can prevent extraordinary musicians from achieving their full potential. All of these people running the program have invested in me, believe in me and support me. It's incredibly moving that all of these people want to see me succeed and are in my corner. 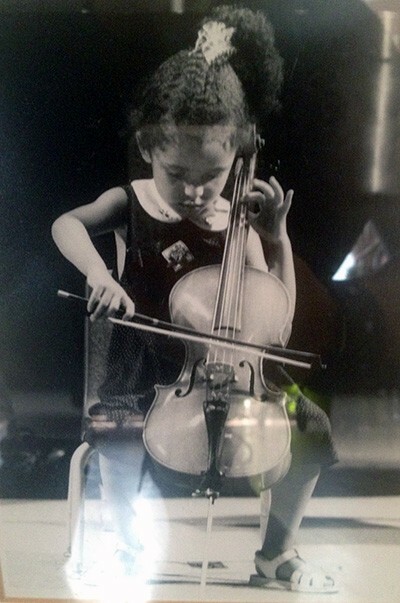 Anita Graef plays her cello at age four. Obviously, Graef eventually received the cello she so coveted. She began studying cello when she was four years old and made her concerto debut at age 12. Her parents are both professional musicians — her father, Richard Graef, is the assistant principal flutist in the Chicago Symphony Orchestra and her mother, Emily Seaberry Graef, is the founder and flutist of Chicago’s Juliani Ensemble. They encouraged her to pursue any career she desired and did not want to pressure her to follow in their musical footsteps — but she did anyway. Graef was home schooled until junior high school, which gave her a flexible schedule to practice cello, explore Chicago and get involved in a number of other activities. She was a competitive horseback rider until college, played volleyball for six years, trained in ballet for seven years and studied piano for 10 years. She was also involved in sports, art classes, photography and worked on her high school year book. She was able to sample what life was like for professional musicians through her parents. When her father went on tours with the Chicago Symphony Orchestra, Graef, her mother and siblings went with him. Together, they visited Europe and China. Graef earned her bachelor’s degree in cello from the University of Michigan’s School of Music, Theatre and Dance. When she arrived at CCM to audition for the college’s graduate cello program, a few professors encouraged her to attend an introductory meeting about the CSO/CCM Diversity Fellowship. The CSO/CCM Diversity Fellowship accepts up to five fellows each year, and is currently accepting applications for the 2019-21 class. Fellows perform the equivalent of five weeks per season with the CSO while enrolled in a two-year Master of Music or Artist Diploma degree program at CCM. Each Fellow receives full tuition scholarship support from CCM, in addition to a $10,000 per year graduate stipend and a one-time Graduate School Deans Excellence Award of $3,000. Each Fellow also receives compensation of $8,000 per season while performing with the CSO. As a master’s student, Graef balances her time between course work and performance work. Mondays, Wednesdays and Fridays tend to be busier days where she is usually at school from 9 a.m. to 4 p.m. in a mix of classes and ensemble meetings. Her fall semester at CCM includes courses in music theory, music history, a chamber music seminar with the Ariel Quartet and more. After class, she practices cello or works on school projects. Shannon Lock, violin, Hyeji Park Miranda, piano, and Anita Graef, cello, after their trio recital. 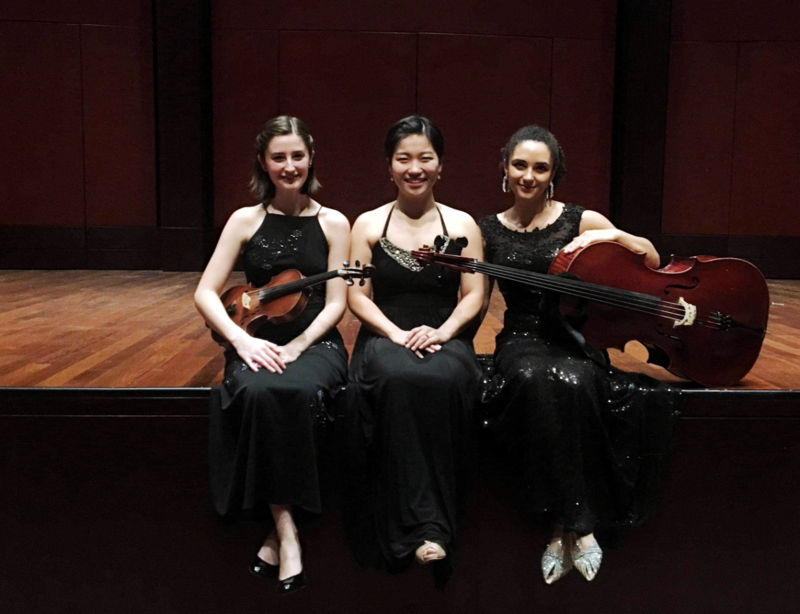 She is the principal cellist in the CCM Philharmonia and she performs in a trio with CCM students Shannon Lock, violin, and Hyeji Park Miranda, piano. Graef’s favorite concert at CCM was when she performed works by Haydn and Shostakovich with the trio. When she isn’t in class or at the CSO, Graef enjoys exploring Cincinnati and spending time with friends. She has visited many of Cincinnati’s museums and parks — she loves Eden Park — and is always looking for restaurant recommendations. Graef is also passionate about weight lifting, which helps her posture as a musician, and loves cooking and reading. She stays on top of everything by looking ahead, staying goal-oriented and communicating with her professors, she says. Graef takes private cello lessons with CCM professor Ilya Finkelshteyn, principal cellist of the CSO, who also mentors her at the orchestra. "One of the most beneficial parts for me has been the one-on-one lessons I get with my teacher,” Graef says. She most recently performed in the CSO’s “One City: Beethoven 9” concert at Cincinnati’s Music Hall. Last year, during her first year as a Diversity Fellow, Graef performed Tchaikovsky’s Symphony No. 6 with the CSO. Graef is looking forward to performing Mahler’s Symphony No. 5 at the CSO’s 2018-19 season finale in May. It’s a very rigorous program but it’s incredibly rewarding. You learn a lot about music, about yourself, about the process of working and obtaining a permanent job in a symphony orchestra and you’ll meet incredible people along the way and make lifelong relationships. CCM and the CSO are now accepting applications for the 2019-21 class of Fellows. The application deadline is Dec. 1, 2018. For application and audition requirements, visit us at ccm.uc.edu/chance2perform. Apply online now at ccm.uc.edu/admissions/application/gradapplication. Questions? Email us at ccmadmis@uc.edu.